The leaves may have barely begun to fall, and the still-strong sun banishes thoughts of December. But like it or not, the holiday shopping season, in all its gift-giving cheer and consumerist frenzy, is already underway. 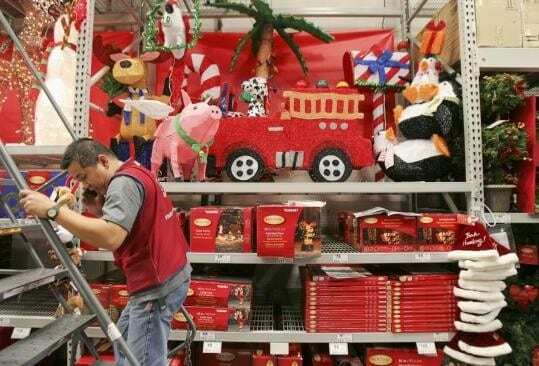 It began even earlier than usual this year, with a few stores displaying Christmas items in July. The accelerated arrival of ceramic Santa Clauses and faux-pine wreaths at retail outlets is a much-lamented phenomenon known as Christmas creep. And as retailers jockey for a piece of increasingly limited holiday budgets in a make-or-break game of one-upmanship, it shows little sign of retreat. But retailers, who typically rely on the holiday season for at least 25 percent of their annual sales, say Hernandez belongs to a dwindling minority, especially as a bleak economy forces families to snap up bargains whenever they can. With holiday sales at a premium, retailers are pulling out all the stops to attract cost-conscious consumers as early as possible. Photo by The Boston Globe.